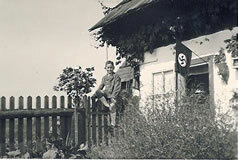 The KZ-Auxiliary Camp is located in the upper part of Styria in a village called Bretstein, about 30 km northwest of Judenburg. There existed a trading partnership between the SS owned "Deutsche Versuchsanstalt für Ernährung und Verpflegung GmbH" (German Research Institute for nourishment and rations) and the camp in Bretstein. In 1939 the horse and sheep breeding economic union started on three mountain farms in Bretstein valley. The camp prisoners, mainly Republic Spaniards and members of Jehova´s witnesses were forced to build a road towards Brestein valley and to do agricultural work. The dismal and depressing lot of the prisoners led to several attempts to escape. On 30th September 1943 the camp was shut.